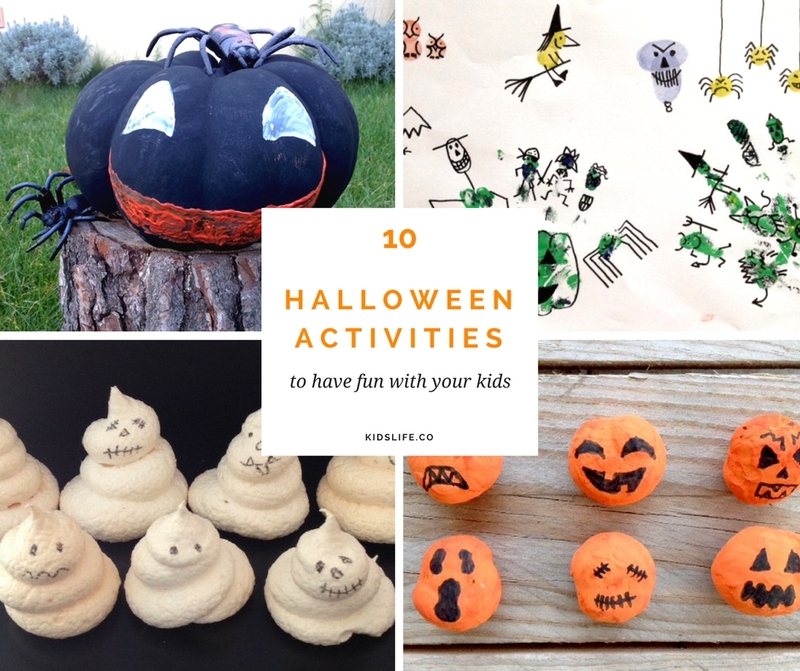 This year, I started early with the boys because I wanted to try several activities that I found on Pinterest. And I have to tell you that the first 4 ones worked pretty well: the first one gave us a great laugh, the second one was a success for the twins and the third one was a lot of fun for them. As for the fourth one, I am the one who loved it. As we go along with our realisations, I will keep on completing the article to give you some more ideas. 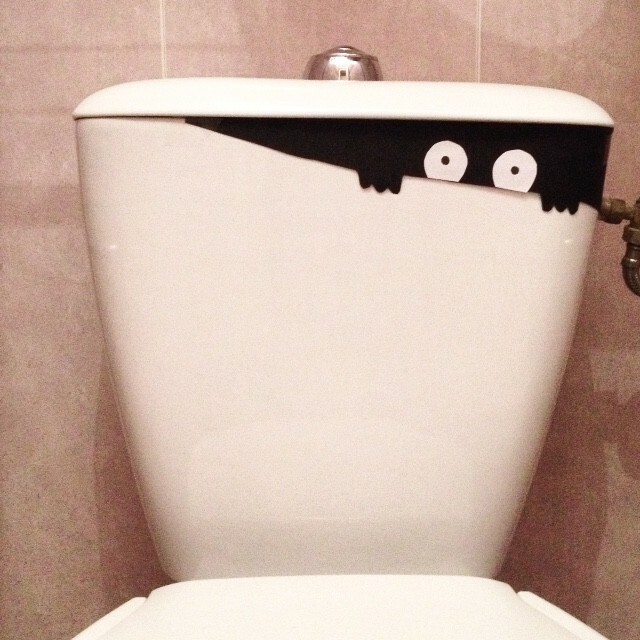 A little funny and really quick diy to do (for the parents, it will be a little longer if realised by a child). 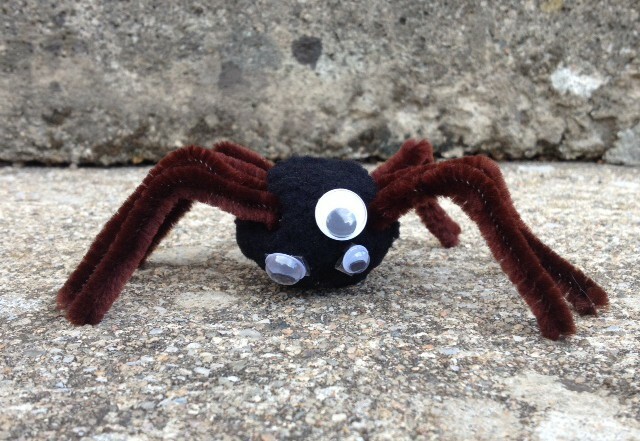 Equipment: pompons, chenille yarn (2 sticks to make a spider) and some eyes. You just have to hang the spiders here and there on Halloween day to scare your children! We loved this activity. On the one hand because it is very simple to set up. On the other hand, because it is suitable for younger children and that is awesome! 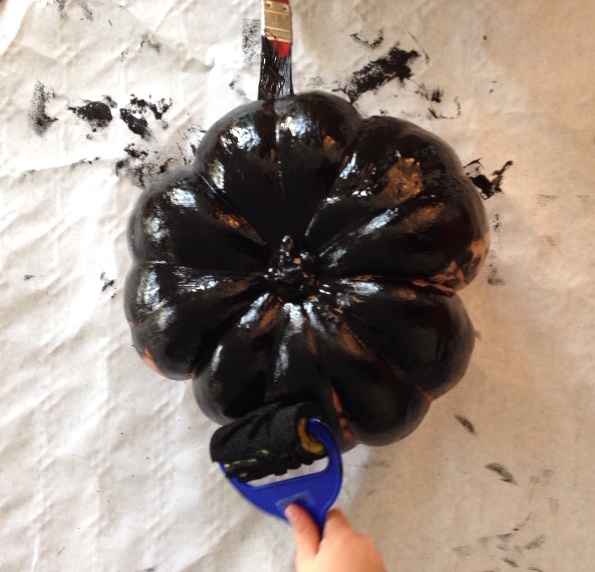 Equipment: a white sheet of paper, a black sheet of paper, some paint and some stamp paintbrushes. You just need to draw a few bat silhouettes on a white sheet. 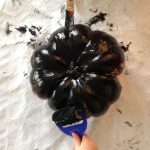 Stick those silhouettes on the black sheet, let your child have fun with the brushes, take the silhouettes off and there you have it! 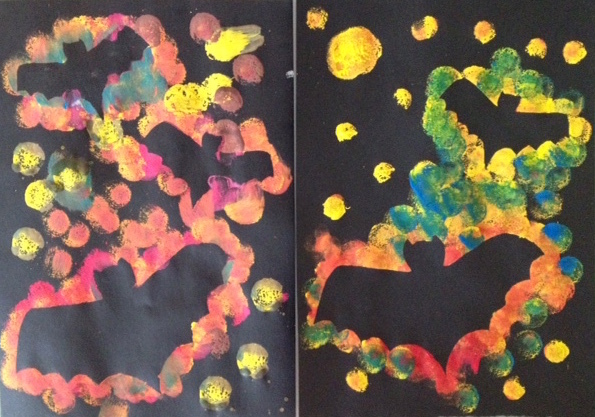 You can even reuse the bat silhouettes to realise another drawing. 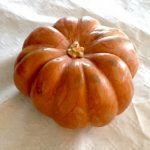 I had to plan an activity with a pumpkin! For me, it is the most striking Halloween symbol. This time, it is my oldest son who really loved it. 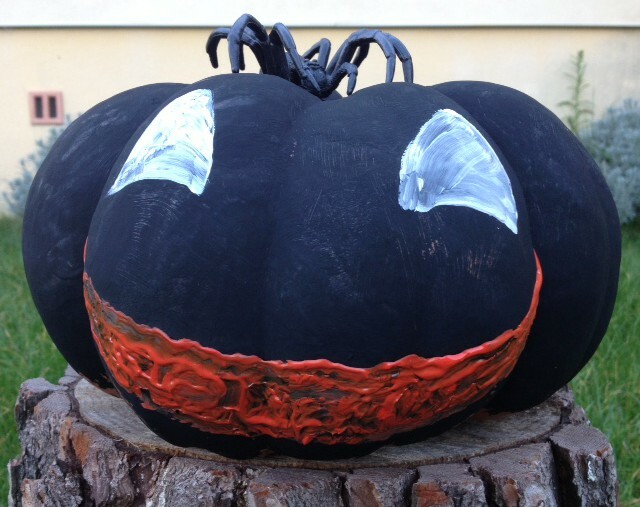 The 3 of them had a lot of fun painting the pumpkin black, then I did the eyes and finally my oldest son realised the mouth. 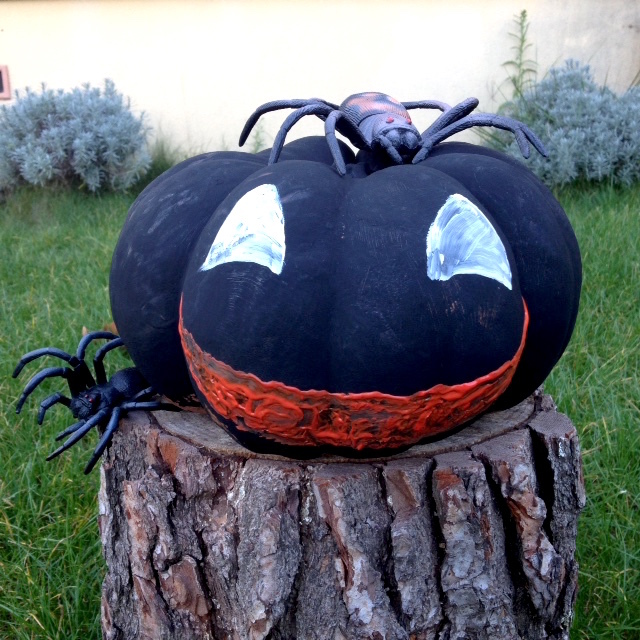 I think that I will try to carve it before October 31th to put some lights inside. Of course, I will show you the outcome! Well now, nothing simpler, faster, greater! 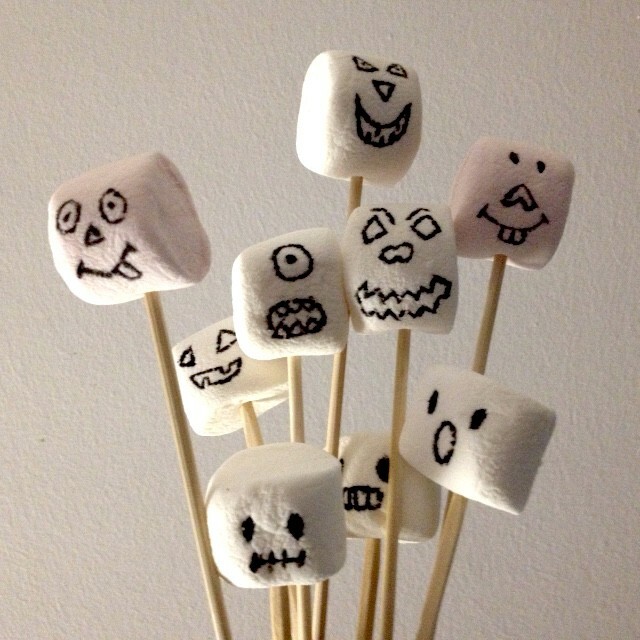 Amaze your children, your family, your friends and turn simple marshmallows into super funky groovy monsters. Equipment: marshmallows and alimentary felts. 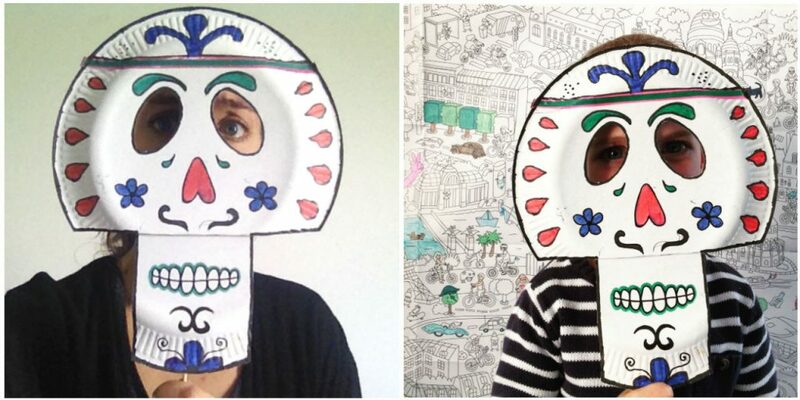 In the meantime, keep this idea for your children’s next birthdays! Moreover, to complement these activities you can also go and see all the Halloween children costumes. 10/4 addition. 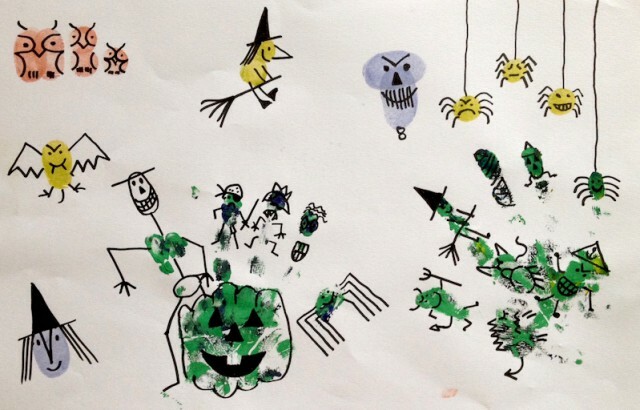 A new and really nice activity that we have just realised: using your children’s hand and finger prints and turn them into characters, monsters and other Halloween animals. Very easy to do and children of various ages can enjoy it. Pumpkins, witches, skeletons, cats, skulls, spiders, there are a lot of choices! 10/8 addition. 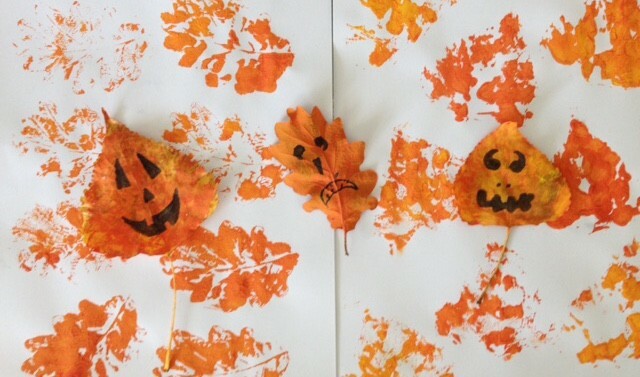 So today, I planned to do a little autumnal activity with the kids: painting on leaves from different trees, that we picked up the day before at the park, and make prints of them on a white paper sheet. And that is what we did. Equipment: autumn leaves (or spring, or summer), paint. I just customized the leaves in the end to use them as Halloween decorations! Well, you get the concept? 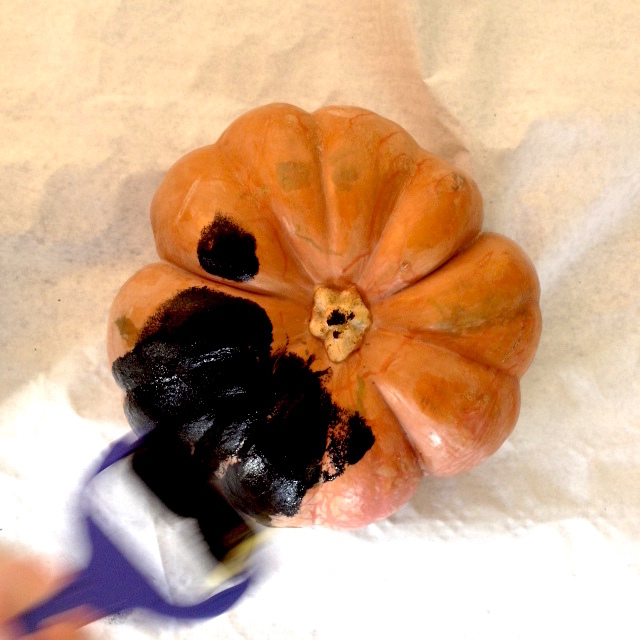 You just need to paint the chestnut orange, to let it dry and to draw hideous faces on it. 10/9 addition. Another DIY from scratch and done in 2 minutes! I love it because I will be able to use it again for costume parties, yeaaaah! Equipment: 2 paper plates, some tape, scissors and felts + a little stick. Cut the 2 paper plates like indicated below. 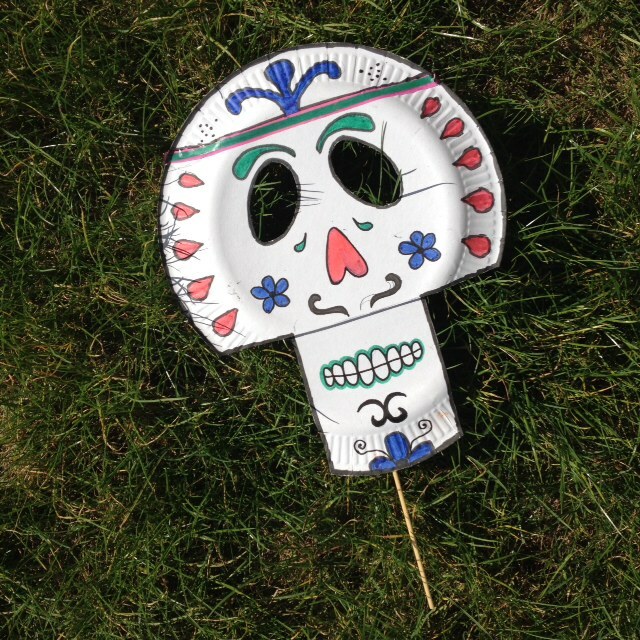 Put them together by taping them inside, draw a great Mexican skull, fix a stick to hold the mask and there you have it! 10/12 addition. The fastest DIY in the west! Honestly, it took me 3 minutes to do and the outcome is just… awesome!! I love it! Equipment: a black sheet of paper, a white sheet of paper. 10/12 addition. To change, here is a little culinary DIY! My son wanted to bake something today. 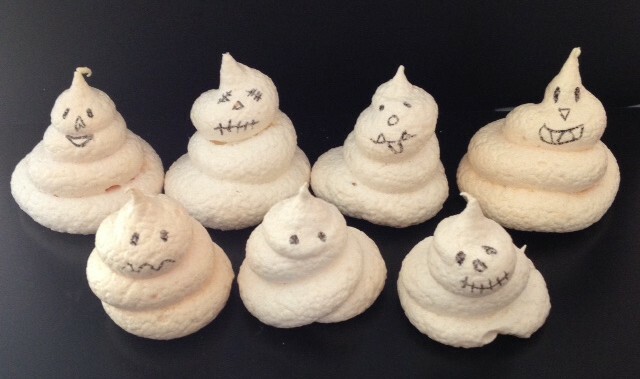 Ah children’s obsessions… So, I suggested him to do these little ghost shaped meringues that I had seen on Pinterest. Equipment: 2 egg whites, 125g of sugar, an electric mixer. Really easy to do, the French meringue is a good recipe idea for a child to do. You just need to beat the egg whites and to progressively add the sugar (once the whites are beaten). 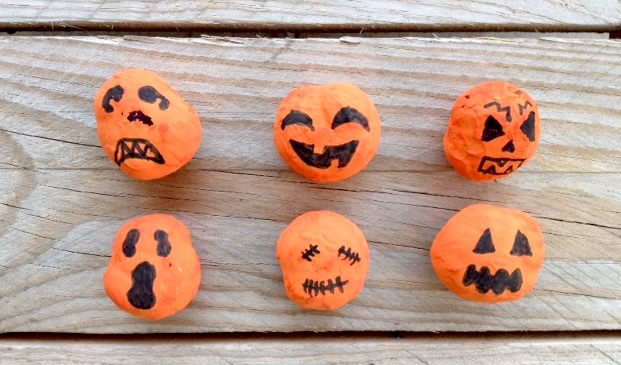 After that you have to let your imagination speak to turn them into a delicious Halloween snack! And to complement all these activities, you can go and see our selection of Halloween costumes.